In numerical analysis, a branch of mathematics, there are several square root algorithms or methods of computing the principal square root of a non-negative real number. For the square roots of a negative or complex number, see below. These methods generally yield approximate results, but can be made arbitrarily precise by increasing the number of calculation steps. These approximations are useful to find better seeds for iterative algorithms, which results in faster convergence. "Heron's method" redirects here. For the formula used to find the area of a triangle, see Heron's formula. 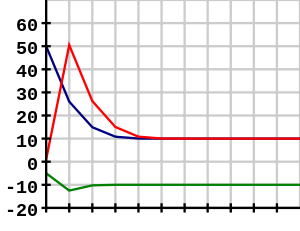 Graph charting the use of the Babylonian method for approximating a square root of 100 (±10) using starting values x0 = 50, x0 = 1, and x0 = −5. Note that a positive starting value yields the positive root, and a negative starting value the negative root. is known as the Babylonian method, despite there being no direct evidence, beyond informed conjecture, that the eponymous Babylonian mathematicians employed exactly this method. The method is also known as Heron's method, after the first-century Greek mathematician Hero of Alexandria who gave the first explicit description of the method in his AD 60 work Metrica. The basic idea is that if x is an overestimate to the square root of a non-negative real number S then S/x will be an underestimate, or vice versa, and so the average of these two numbers may reasonably be expected to provide a better approximation (though the formal proof of that assertion depends on the inequality of arithmetic and geometric means that shows this average is always an overestimate of the square root, as noted in the article on square roots, thus assuring convergence). Begin with an arbitrary positive starting value x0 (the closer to the actual square root of S, the better). Let xn + 1 be the average of xn and S/xn (using the arithmetic mean to approximate the geometric mean). Repeat step 2 until the desired accuracy is achieved. This algorithm works equally well in the p-adic numbers, but cannot be used to identify real square roots with p-adic square roots; one can, for example, construct a sequence of rational numbers by this method that converges to +3 in the reals, but to −3 in the 2-adics. and consequently that convergence is assured, and quadratic. Rounding errors will slow the convergence. It is recommended to keep at least one extra digit beyond the desired accuracy of the xn being calculated to minimize round off error. This gives a rational approximation to the square root. It can be easier for manual calculations. Every digit of the root found is known to be correct, i.e., it does not have to be changed later. If the square root has an expansion that terminates, the algorithm terminates after the last digit is found. Thus, it can be used to check whether a given integer is a square number. The algorithm works for any base, and naturally, the way it proceeds depends on the base chosen. Napier's bones include an aid for the execution of this algorithm. The shifting nth root algorithm is a generalization of this method. Now using the Digit-by-Digit algorithm, we first determine the value of X. X is the largest digit such that X2 is less or equal to Z from which we removed the 2 rightmost digits. In the next iteration, we pair the digits, multiply X by 2, and place it in the tenth's place while we try to figure out what the value of Y is. Since this is a simple case where the answer is a perfect square root XY, the algorithm stops here. at any m-th stage. The section below codifies this procedure. Also, the fact that multiplication by 2 is done by left bit-shifts helps in the computation. Write the original number in decimal form. The numbers are written similar to the long division algorithm, and, as in long division, the root will be written on the line above. Now separate the digits into pairs, starting from the decimal point and going both left and right. The decimal point of the root will be above the decimal point of the square. One digit of the root will appear above each pair of digits of the square. Starting on the left, bring down the most significant (leftmost) pair of digits not yet used (if all the digits have been used, write "00") and write them to the right of the remainder from the previous step (on the first step, there will be no remainder). In other words, multiply the remainder by 100 and add the two digits. This will be the current value c.
. We will use a new variable y = x(20p + x). Note: 20p + x is simply twice p, with the digit x appended to the right). Note: x can be found by guessing what c/(20·p) is and doing a trial calculation of y, then adjusting x upward or downward as necessary. as the next digit of the root, i.e., above the two digits of the square you just brought down. Thus the next p will be the old p times 10 plus x.
Subtract y from c to form a new remainder. If the remainder is zero and there are no more digits to bring down, then the algorithm has terminated. Otherwise go back to step 1 for another iteration. Find the square root of 152.2756. Find the square root of 2.
can be replaced with faster bit shift operations. Here we obtain the square root of 81, which when converted into binary gives 1010001. The numbers in the left column gives the option between that number or zero to be used for subtraction at that stage of computation. The final answer is 1001, which in decimal is 9. // "bit" starts at the highest power of four <= the argument. to run one extra time removing the factor of 2 from res making it our integer approximation of the root. Faster algorithms, in binary and decimal or any other base, can be realized by using lookup tables—in effect trading more storage space for reduced run time. The denominator in the fraction corresponds to the nth root. In the case above the denominator is 2, hence the equation specifies that the square root is to be found. The same identity is used when computing square roots with logarithm tables or slide rules. The Vedic duplex method from the book 'Vedic Mathematics' is a variant of the digit-by-digit method for calculating the square root. The duplex is the square of the central digit plus double the cross-product of digits equidistant from the center. The duplex is computed from the quotient digits (square root digits) computed thus far, but after the initial digits. The duplex is subtracted from the dividend digit prior to the second subtraction for the product of the quotient digit times the divisor digit. For perfect squares the duplex and the dividend will get smaller and reach zero after a few steps. For non-perfect squares the decimal value of the square root can be calculated to any precision desired. However, as the decimal places proliferate, the duplex adjustment gets larger and longer to calculate. The duplex method follows the Vedic ideal for an algorithm, one-line, mental calculation. It is flexible in choosing the first digit group and the divisor. Small divisors are to be avoided by starting with a larger initial group. In other words, to calculate the duplex of a number, double the product of each pair of equidistant digits plus the square of the center digit (of the digits to the right of the colon). In a square root calculation the quotient digit set increases incrementally for each step. Consider the perfect square 2809 = 532. Use the duplex method to find the square root of 2,809. Set down the number in groups of two digits. Define a divisor, a dividend and a quotient to find the root. Given 2809. Consider the first group, 28. Find the nearest perfect square below that group. The root of that perfect square is the first digit of our root. Since 28 > 25 and 25 = 52, take 5 as the first digit in the square root. For the divisor take double this first digit (2 · 5), which is 10. Next, set up a division framework with a colon. Put a colon to the right of 28 and 5 and keep the colons lined up vertically. The duplex is calculated only on quotient digits to the right of the colon. Calculate the remainder. 28: minus 25: is 3:. Append the remainder on the left of the next digit to get the new dividend. The zero remainder appended to 9. Nine is the next dividend. This provides a digit to the right of the colon so deduct the duplex, 32 = 9. Subtracting this duplex from the dividend 9, a zero remainder results. Ten into zero is zero. The next root digit is zero. The next duplex is 2(3·0) = 0. The dividend is zero. This is an exact square root, 53. Find the square root of 2809. The number of groups gives the number of whole digits in the root. Put a colon after the first group, 28, to separate it. 28>25=52 and by doubling this first root, 2x5=10.
. Moreover, the following method does not employ general divisions, but only additions, subtractions, multiplications, and divisions by powers of two, which are again trivial to implement. A disadvantage of the method is that numerical errors accumulate, in contrast to single variable iterative methods such as the Babylonian one. This method was developed around 1950 by M. V. Wilkes, D. J. Wheeler and S. Gill for use on EDSAC, one of the first electronic computers. The method was later generalized, allowing the computation of non-square roots.
. These iterations involve only multiplication, and not division. They are therefore faster than the Babylonian method. However, they are not stable. If the initial value is not close to the reciprocal square root, the iterations will diverge away from it rather than converge to it. It can therefore be advantageous to perform an iteration of the Babylonian method on a rough estimate before starting to apply these methods. faster than Newton-Raphson iteration on a computer with a fused multiply–add instruction and either a pipelined floating point unit or two independent floating-point units. may be used at the end rather than computing it through in each iteration. is as small as possible. Taking the first three denominators give the rational approximation of √2 as [1;2,2,2] = 17/12 = 1.41667, correct up to first three decimal places. Taking the first five denominators gives the rational approximation to √2 as [1;2,2,2,2,2] = 99/70 = 1.4142857, correct up to first five decimal places. Taking more denominators give better approximations. Notice that mn, dn, and an are always integers. The algorithm terminates when this triplet is the same as one encountered before. The algorithm can also terminate on ai when ai = 2 a0, which is easier to implement. Begin with m0 = 0; d0 = 1; and a0 = 10 (102 = 100 and 112 = 121 > 114 so 10 chosen). So, m1 = 10; d1 = 14; and a1 = 1. Next, m2 = 4; d2 = 7; and a2 = 2. Now, loop back to the second equation above. which is now [10;1,2, 10,2,1,20,1,2, 10,2,1,20,1,2, ...] evaluated at the third term and every six terms thereafter. , and as such, is an excellent rational approximation to it.
. This is the hard part; It can be done either by guessing, or by using fairly sophisticated techniques. is good to an order of magnitude. Next, recognise that some powers, p, will be odd, thus for 3141.59 = 3.14159 × 103 rather than deal with fractional powers of the base, multiply the mantissa by the base and subtract one from the power to make it even. The adjusted representation will become the equivalent of 31.4159 × 102 so that the square root will be √31.4159 × 10. If the integer part of the adjusted mantissa is taken, there can only be the values 1 to 99, and that could be used as an index into a table of 99 pre-computed square roots to complete the estimate. A computer using base sixteen would require a larger table, but one using base two would require only three entries: the possible bits of the integer part of the adjusted mantissa are 01 (the power being even so there was no shift, remembering that a normalised floating point number always has a non-zero high-order digit) or if the power was odd, 10 or 11, these being the first two bits of the original mantissa. Thus, 6.25 = 110.01 in binary, normalised to 1.1001 × 22 an even power so the paired bits of the mantissa are 01, while .625 = 0.101 in binary normalises to 1.01 × 2−1 an odd power so the adjustment is to 10.1 × 2−2 and the paired bits are 10. Notice that the low order bit of the power is echoed in the high order bit of the pairwise mantissa. An even power has its low-order bit zero and the adjusted mantissa will start with 0, whereas for an odd power that bit is one and the adjusted mantissa will start with 1. Thus, when the power is halved, it is as if its low order bit is shifted out to become the first bit of the pairwise mantissa. A table with only three entries could be enlarged by incorporating additional bits of the mantissa. However, with computers, rather than calculate an interpolation into a table, it is often better to find some simpler calculation giving equivalent results. Everything now depends on the exact details of the format of the representation, plus what operations are available to access and manipulate the parts of the number. For example, Fortran offers an EXPONENT(x) function to obtain the power. Effort expended in devising a good initial approximation is to be recouped by thereby avoiding the additional iterations of the refinement process that would have been needed for a poor approximation. Since these are few (one iteration requires a divide, an add, and a halving) the constraint is severe. , and removing a bias of 127, i.e.
. In a similar fashion you get 0.5 from 1.5 (0x3FC00000). where a is a bias for adjusting the approximation errors. For example, with a = 0 the results are accurate for even powers of 2 (e.g., 1.0), but for other numbers the results will be slightly too big (e.g.,1.5 for 2.0 instead of 1.414... with 6% error). With a = -0x4B0D2, the maximum relative error is minimized to ±3.5%. , then the reciprocal form shown in the following section is preferred. instead, was written by Greg Walsh. The integer-shift approximation produced a relative error of less than 4%, and the error dropped further to 0.15% with one iteration of Newton's method on the following line. In computer graphics it is a very efficient way to normalize a vector. Some VLSI hardware implements inverse square root using a second degree polynomial estimation followed by a Goldschmidt iteration. is the modulus of S. The principal square root of a complex number is defined to be the root with the non-negative real part. ^ Fowler, David; Robson, Eleanor (1998). "Square Root Approximations in Old Babylonian Mathematics: YBC 7289 in Context". Historia Mathematica. 25 (25): 376. doi:10.1006/hmat.1998.2209. Retrieved 14 October 2018. ^ Heath, Thomas (1921). A History of Greek Mathematics, Vol. 2. Oxford: Clarendon Press. pp. 323–324. ^ Bailey, David; Borwein, Jonathan (2012). "Ancient Indian Square Roots: An Exercise in Forensic Paleo-Mathematics" (PDF). American Mathematical Monthly. 119 (8). pp. 646–657. Retrieved 2017-09-14. ^ Sri Bharati Krisna Tirthaji (2008) . Vedic Mathematics or Sixteen Simple Mathematical Formulae from the Vedas. Motilal Banarsidass. ISBN 978-8120801639. ^ M. V. Wilkes, D. J. Wheeler and S. Gill, "The Preparation of Programs for an Electronic Digital Computer", Addison-Wesley, 1951. ^ M. Campbell-Kelly, "Origin of Computing", Scientific American, September 2009. ^ J. C. Gower, "A Note on an Iterative Method for Root Extraction", The Computer Journal 1(3):142–143, 1958. ^ Markstein, Peter (November 2004). Software Division and Square Root Using Goldschmidt's Algorithms (PDF). 6th Conference on Real Numbers and Computers. Dagstuhl, Germany. CiteSeerX 10.1.1.85.9648. ^ Meher, Pramod Kumar; Valls, Javier; Juang, Tso-Bing; Sridharan, K.; Maharatna, Koushik (2008-08-22). "50 Years of CORDIC: Algorithms, Architectures and Applications" (PDF). IEEE Transactions on Circuits & Systems-I: Regular Papers (published 2009-09-09). 56 (9): 1893–1907. doi:10.1109/TCSI.2009.2025803. Retrieved 2016-01-03. ^ Beceanu, Marius. "Period of the Continued Fraction of sqrt(n)" (PDF). Theorem 2.3. Archived from the original (PDF) on 21 December 2015. Retrieved 21 December 2015. ^ Gliga, Alexandra Ioana (March 17, 2006). On continued fractions of the square root of prime numbers (PDF). Corollary 3.3. Weisstein, Eric W. "Square root algorithms". MathWorld.